Jalen Ramsey has said his piece, insisting he does not fear New England Patriots tight end Rob Gronkowski. He shared his opinion on some of the top NFL quarterbacks and playmakers – most notably Gronkowski – which makes Sunday's game between Jacksonville and New England a marquee matchup between arguably the best cornerback and tight end in the league. "He's good. He's good, now," Ramsey said on Thursday, via ESPN. "We ain't going to get it twisted. He's good, but, you saying this to me, is this supposed to bring fear to me or something? 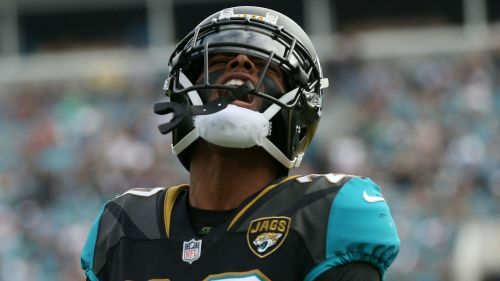 Ramsey, a third-year corner for the Jaguars, has called Gronkowski overrated and said the two-time Super Bowl champion has had problems in the past matching up with corners. If Ramsey lines up across Gronkowski, expect a show, but if another Jaguar has to take on the tight end, Ramsey is confident he can be stopped. "I'm going to go out there and do whatever the coach asks me to do," Ramsey said. "If it happens, it happens. If it doesn't, it doesn't. I'm very confident in all of my team-mates on the defensive side of the ball. Whoever goes against him, I'm very confident they'll hold it down and I'll do my job and I'll hold it down where I'm at. "When you play the game of football, I feel like, to respect the game, you have to play it fierce. I don't believe in having friends on the field. I mean, my brother, my dad, my mom, grandma was out there, it's on. After the game we can be cool. It doesn't matter. That's how I feel like you've got to respect the game of football."